Eyebrow threading is an eco-friendly form of hair removal. Threading does not require the use of hot waxes or abrasive chemicals. A twisted cotton thread is rolled onto the desired hairline, such as the eyebrow, removing the hair at the base of the skin. Threading can remove an entire row of hair all at once. Since the hair is removed from the base, the hair will usually grow back thinner and finer. Learn The History of Eyebrow Threading. 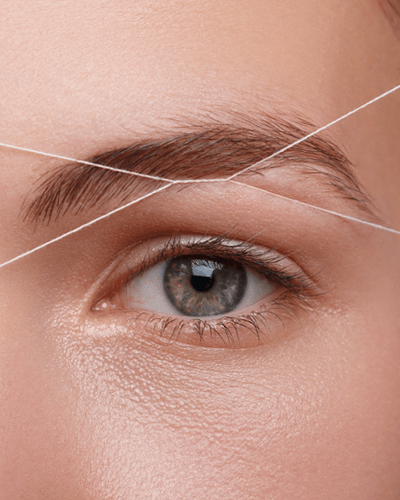 Learn about misconceptions that are related to Eyebrow Threading. The advantages of eyebrow threading. Learn the best eyebrow shapes for both men and women based on facial recognition. How to select different tips types of thread suited for different body areas. Skills on how to interacting with clients. Best practice on how to disinfection, appropriate sanitation standards, and skin preparation. Learn how to hold and control the thread using multiple different threading methods, to see which one best fits you. How to simultaneously manipulate and control the thread and spool. Learn how to thread around the neck, shoulder area. Gain an understanding about the amount of thread that is necessary to cut and tie together. Learn the placement of forefingers and thumbs. Learn the Double Loop Threading Method and demonstrate the ideal situation when the method should be used on a client. Use hands-on practicing to focus on challenging areas. Learn how to up-loop and reverse the threads directions.